Chances are that they don’t use analytics at all, but what if they did? imagine the possibilities. Then I spotted the candy vending machine and noticed that a bag of M&M’s cost twice as much as a bag of skittles, which was 12% cheaper than the bag of cheesy popcorn and 5% more expensive than gum. The pricing just didn’t make sense. Was it demand based? Item-cost based? Margin based? Or was it simply random? 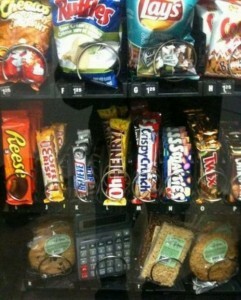 Do you think vending machine operators stock based on previous demand? The fact that we’re always out of Diet Coke tells me that our contractor doesn’t, but what if he did? In both of these cases (and you though I wouldn’t be able to tie hookers and vending machines together…) there are probably metrics involved, but what metrics? I know that both the hookers and vending machine operators are looking at things like cost, revenue, margin and the other basics. They wouldn’t be able to sustain their business if they didn’t. And that’s the point. Analytics are everywhere; but it’s not just if you’re measuring it’s what you’re measuring that matters. The same applies to your SEO, Affiliate marketing, and general website strategies. The out of the box metrics like pageviews and visits over time are great, but how actionable are they? Can they really help you make decisions to improve your business?